Welcome to the Career-Technical Education Technical Testing Project! CETE at The Ohio State University is the selected vendor for creating and maintaining Ohio’s Statewide Career-Technical Education (CTE) Technical Testing System. This End-of-Course testing system is used to evaluate student knowledge and technical skill attainment upon completion of a CTE course within a program of study. Subject Matter Experts (SMEs) participate in content domain creation and alignment, development of items, validation of items, and provide input into performance standards. 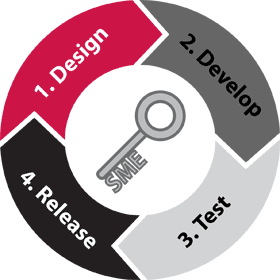 The SME is Key when it comes to the creation and revision of tests. SMEs possess the knowledge and expertise needed to develop the test content, review the test content, and provide judgments about the quality of the test. Our role is to provide trained facilitators who will guide SMEs in writing and reviewing test items in order to create high quality tests. Share your Expertise: Participate in Item-Writing and Validation Workshops! CETE, in collaboration with the Ohio Department of Education (ODE) and Ohio Department of Higher Education (ODHE), is recruiting Subject Matter Experts (SMEs) to participate in Item-Writing and Validation workshops for the coming school year. To apply please go to the registration survey. Upon completion of the survey, a CETE recruiter will follow up with you via email. For more information, contact CETE recruiting.